Social learning has long been seen as a positive direction in education with many advantages for learners. 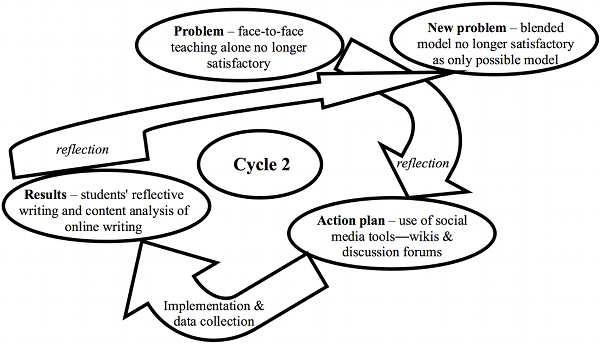 This paper describes an ongoing action research project carried out by a teacher educator at a pre-service teacher education college using social learning in her teaching through the use of computer-supported collaborative learning methods and tools. The paper traces the action research cycles, including analysis of the data collected that facilitated the transition from one cycle to the next. These data comprise class feedback, college student satisfaction surveys, students' reflective writing, and content analysis of online cooperative interaction. The paper concludes with a suggestion for an additional cycle in which an entire course will be offered through a Facebook page instead of the institutional learning management system. It has long been acknowledged that learning is not necessarily an individual undertaking, and social aspects of learning have been clearly recognized in both the academic and practice communities as contributing greatly to successful acquisition and retention of knowledge (Chatti, Jarke, & Specht, 2010; Hsu, Hwang, Huang, & Liu, 2011; Kehrwald, 2008; Lin, 2011; Raidal & Volet, 2009; Salomon & Perkins, 1998; Slagter van Tryon & Bishop, 2009; Vygotsky, 1978; Webb & Palincsar, 1996; Wenger, 1998). The social aspect of learning has also assumed great importance in discussions on online learning, with much of the current literature emphasizing the significance of online learning as a social endeavor, or computer-supported collaborative learning (CSCL) (Arnold & Ducate, 2006; Lear, Ansorge, & Steckelberg, 2010; Levin, He, & Robbins, 2006; Sela, 2010a, 2010b). This is reflected in the move from individual learning, typical of the first generation of online learning (Web 1.0), to social and cooperative constructivist-based learning, typical of the present generation (Web 2.0), through the use of social software tools such as wikis and discussion forums (Deters, Cuthrell, & Stapleton, 2010; Hart, 2008; Kesim & Agaoglu, 2007). Most researchers agree that social activities form the core of present day online learning (Chou & Chen, 2008; Deters et al., 2010; Downes, 2008; Garrison, Anderson, & Archer, 2000; Hughes & Narayan, 2009; Kesim & Agaoglu, 2007; Lear et al., 2010; Owen, Grant, Sayers, & Facer, 2006). However, acknowledging this fact is not enough; the implications of social learning for present-day pedagogy need to be examined, both at K-12 level and in teacher education. If the idea of social learning remains at the level of discussion, without incorporating it as meaningful practice into our teaching, it will stay an abstract concept, which would defeat the purpose of the research. This paper describes an ongoing action research project aimed at promoting social learning of different types in pre-service teacher education. The project was inspired by the author's belief in the importance of social learning in its classic form (i.e., pair work and group work), and was sustained by her awareness of additional benefits of social learning within the framework of online instruction. The author lectures at a pre-service teacher education college, and considers the modeling of good teaching an important part of her role as a teacher educator. Thus, rather than expounding on the importance of social learning to her students, she has tried to model the practice through her own teaching. Over time, she has attempted to improve this methodology through action research; that is, by performing an ongoing process of reflection on the practice (Cohen, Manion, & Morrison, 2000). The purpose of this paper is not to present a large-scale study with generalizable results; rather, the aim is to describe this process from the point of view of a practicing teacher educator, with the intention of inspiring other teacher educators and offering some practical ideas for promoting CSCL. It should be noted that the terms "cooperative learning" and "collaborative learning" are used interchangeably in this paper to refer to social learning, as they are used in most of the relevant literature. Chatti et al. (2010) emphasize that knowledge and learning are social in nature, citing many sources (Vygotsky, 1978; Wenger, 1998) in support of this claim. These theoreticians discuss learning as a social activity, an idea based on constructivist epistemology, the full depth and breadth of which is too extensive for the present discussion. In general, in these approaches learning is viewed as a constructivist process that is both personal and social, with an emphasis on the latter (Kehrwald, 2008). The social constructivist approach (Vygotsky, 1978) describes learning as construction of knowledge through interaction with others. Knowledge is not presented to or acquired by individuals; rather, it emerges from a dialogue in which the learners create their own knowledge. Vygotsky's concept of the zone of proximal development refers to the "space" a more knowledgeable person provides to a less knowledgeable one, as assistance in the construction of knowledge. According to this view socialization is fundamental to the learning process (Bell, Urhahne, Schanze, & Ploetzner, 2010; Lin, 2011; Slagter van Tryon & Bishop, 2009). There is much evidence that students benefit from working in collaborative teams by giving and receiving help, sharing knowledge, building on the ideas of others, and recognizing and dealing with contradictions between their own perspectives and those of their peers (Hsu et al., 2011; Kirschner, Paas, & Kirschner, 2009; Lin, 2011). Over the past few years, the Web in general, and online teaching and learning specifically, have developed in the same direction. The first Internet generation, Web 1.0, was characterized by individual web-based activities, including learning; this evolved into the present-day, second Internet generation, Web 2.0, which is characterized by a very strong social emphasis, including tools, sites, and learning activities (Minocha, 2009; Sela, 2010b). Rutherford (2010) traces the term "Web 2.0" to 2004, when it was first used to describe "websites that allowed users to interact with each other as contributors to a website's content" (p. 703). This innovation was very quickly adopted and adapted by millions around the world, including educators at different levels, who were inspired by the philosophy of user engagement, collaboration, and interactive information sharing, in contrast to the former concept of knowledge transmission from teacher to students. As a result of growing interest in learning as a social activity, together with the development of educational tools on the Web, many schools and academic institutions use the new social software. The increased collaboration and communication among learners has led to the construction of knowledge as a social endeavor (Chai, Koh, & Tsai, 2010; Chatti et al., 2010; Minocha, 2009). The area of CSCL has also become the subject of many studies that show that use of social software tools and sites complements collaborative face-to-face (F2F) learning, adds new dimensions, and overcomes limitations. Chai et al. (2010) discuss the use of collaborative online learning in pre-service teacher education, which has a strong positive effect on student achievement, as well as satisfaction. Huang, Huang, and Yu (2011) compared F2F and online cooperative learning in college courses, concluding that the latter has many advantages not afforded by the former, such as overcoming time and place limitations. Lin (2011) found a high level of student satisfaction regarding online collaborative learning in college courses. Additional studies support these findings, consistently demonstrating the advantages of CSCL over both online individual learning and F2F cooperative learning (Hsu et al., 2011; Kehrwald, 2008; Minocha, 2009; Shana, 2009; Yang, Yeh, & Wong, 2010). The methodological approach selected for the present study is action research. This type of research is directed toward the improvement of teaching practice through continuous cycles of action and reflection (Cohen et al., 2000). It is often described as a type of teacher research conducted by professionals in order to investigate a problem in their work. Coghlan (2004) defines it thus: "action research focuses on research in action, rather than research about action ... research with people, rather than research on people" (pp. 1-2, emphasis in original). That is, unlike other more traditional types of research that look back at the researched situation, action research examines the situation as it is happening while attempting to improve it (Foreman-Peck & Murray, 2008). This research procedure was selected as it facilitates reflection on the cycles of action that many educators experience as they try to improve their practice. The procedure is regarded as research due to the organized manner in which data are collected, reflection is carried out, and new action cycles are planned, each one based on the relevant literature and the author's experience with the former cycle (Cronjé, 2009). The study took place at Oranim Academic College of Education, a teacher education college in Israel with approximately 5,000 students. The author has been teaching at the college for 19 years, mostly courses on subjects in the fields of pedagogy and general education to students studying toward Bachelor of Arts and Master of Education degrees. When she began working at the college, online teaching and learning were almost non-existent. However, this situation changed rapidly and at present most courses use some online components, ranging from a simple course site – where the lecturer uploads texts to be read by students – to completely online courses, using the latest programs and sites. College administration encourages lecturers to incorporate online elements in their courses and offers assistance when required. However, the practice is not mandatory, and lecturers' academic freedom is preserved. Classes typically have between 15 and 25 students; some courses are compulsory, and a variety of electives are offered. The present study discusses the author's work in different courses at the college. Over 100 students were involved in the study, but as they were not required to fill in questionnaires or participate in interviews or observations, they were unaware that research was being conducted. Instead, different teaching tools and procedures were used in the courses, and feedback was collected from the students on a regular basis. These feedback texts, as well as texts produced by the students in the course of their work, were then used as data for the study. In accordance with college regulations it was not necessary to obtain permission from the students to use their texts, as these were given voluntarily and used anonymously. The texts, which provided students' opinions, were used to evaluate the author's work in an attempt to improve her practice (Cohen et al., 2000). Table 1 contains a broad, high-level overview of the four action research cycles. The cycles are described in detail in the ensuing subsections. Individual and whole class teaching was no longer sufficient. Employ different types of cooperative learning. Student satisfaction reflected in college surveys and class feedback. Face-to-face teaching alone no longer satisfactory. Use of social media tools – wikis and discussion forums. Satisfaction as described in students' reflective writing, and levels of cooperation and learning as discovered through content analysis. Blended format no longer satisfactory as only possible model. Student satisfaction reflected through questionnaire. Need to use students' existing non-academic related social media tools. Entire course delivered through Facebook. In assessing her own work, both through college-wide formal student feedback surveys and informal classroom-based feedback, as well as her reflective teaching diary, the author was convinced of the benefits of cooperative learning. The students enjoyed group work and thought it was effective teaching and learning practice. Many students came from a traditional educational background of almost exclusively teacher-led teaching, and found cooperative learning to be a refreshing change. The author continued practicing this way (teacher-led interspersed with cooperative teaching techniques) for a number of years, but with time felt that, rather than improving, her methodology was stagnating. She began considering ways to improve the social aspects of teaching and learning by conferring with colleagues, reading the current literature, and searching for innovative ideas. This was the time (at the beginning of the new century) when online teaching and learning material became available at the college and seemed to present a possible solution to the problem. An overall visual depiction of the first action research cycle is given in Figure 1. As the author began to educate herself regarding online educational tools, she looked for ways of integrating them in her teaching in general, and as promoters of social aspects of learning specifically. The first generation of the World Wide Web (known in retrospect today as "Web 1.0") as applied to education mainly involved uploading of texts to be read by the students and written tasks to be completed and submitted to the teacher. This was clearly a top-down transmission model approach, where users were passive consumers of information delivered by others (Minocha, 2009), parallel to teacher-led F2F teaching. With time, however, online teaching/learning tools and programs continued to develop at a rapid pace, moving in the direction of social work, and forming what would in time be termed Web 2.0, the next generation of Internet-based work. This involved wider user participation, encouraging (indeed, necessitating) the creation of knowledge to be shared with others (Deters et al., 2010; Minocha, 2009; Rutherford, 2010). Here the author recognized an opportunity, not only to integrate online teaching into her work, but at the same time, to use it to further her cooperative learning agenda. She began experimenting with different social media tools, which according to Rutherford (2010) "allow[s] learners to become active participants who co-construct the learning experience with their peers and instructor" (p. 705). Various options were examined and two finally selected: wikis and discussion forums. The following paragraphs briefly describe these tools, explain how they were used, and present the data collected, following their implementation in the author's teaching. Wiki. A wiki is a web-based tool that was not originally constructed for education, but is currently used in educational environments at all levels. The tool allows all participants to write and edit documents together with other participants, and to comment on each other's work as they constantly attempt to improve it (Poyas, 2010). Studies have shown wiki to facilitate constructivist learning, to raise student motivation, encourage students to rewrite and edit their own work in order to improve both style and content, and to support social learning in general (Désilets & Paquet, 2005; Lai & Ng, 2011; Ruth & Houghton, 2009; Wheeler & Wheeler, 2009; Woo et al., 2011). Wikis are used in different ways in education, usually as a means for groups of learners to jointly construct a text. This can be done as the major part of a course or as a smaller component (Ruth & Houghton, 2009). "Thanks Sally, the summary addresses the main points mentioned in the lesson. It is clear and well organized, but I would clarify 'diffusion' not in the translation into Arabic but that the change is actually implemented." This is an example where the writer begins by complimenting the presenting author on her lesson summary, then adds a suggestion aimed at clarifying the text. Following this suggestion, the author did, indeed, explain the term "diffusion" more clearly. "Dear Yardena, thank you for the summary. I would like to comment regarding the top-down and bottom-up models of change. I agree with Yana that top-down change limits the teachers' autonomy and does not give them the opportunity to determine or participate in the change process, but sometimes policy makers are driven by their vision of making an educational reform in the system and avoiding chaos. Therefore, I believe that both models are acceptable, but according to the context of change." This comment relates both to the presenting author (Yardena), and to an earlier comment by another student (Yana). The writer expresses an opinion different from both, yet does so in a polite, acceptable manner. "Dear Nili and all, I want to give a general comment about the lesson summaries. I think that the connection between the subtitles and what follows them should be clarified by the person who summarizes the lesson. What specifically are the words that come after the titles: are they steps, ways, characteristics, stages, types. In your summary, Nili, it is not clear. I also think that there is a need for some kind of elaboration of new terms such as 'initiation'. In this case, who does it? What does he/she initiate? I think that a summary should enable me to remember what I learned in the lesson, and I think that this summary is too brief, missing main examples that were given during the lesson, such as portfolios which began as a small scale success and then expanded. It also lacks elaboration on each of the stages of the educational change model." At the end of each course, feedback was collected from the students in the form of an open-ended questionnaire, administered anonymously and containing seven questions. Two of the questions deal directly with the wiki-based component of the course. The replies were mixed: the positive comments related to: (1) working with peers ("I liked the fact that we publish our work and comment on other students' and get feedback from them"); (2) more time investment on the content ("It made me read a lot which I wouldn't have done otherwise"); (3) the benefits of social learning ("Looking back at the lesson summaries shows a rich resource of information with various people's input based on personal knowledge and experience"); and (4) the advantages of using technology ("The wiki is great! I felt part of the big global world"). The negative comments related to: (1) technical difficulties ("The wiki site was a total failure for me. It took me maybe 6-7 lessons to finally write something and for it to appear on the site correctly"); and (2) social difficulties ("Some students got 20 responses from other students, while others got only 2 or 3"). Discussion forum. A discussion forum is an asynchronous online tool, used primarily for collaborative learning. The forum is used for information exchange, knowledge sharing and discussion of common issues. The participants write to the forum when they want to pass on information to their peers, ask for advice, or share an interesting story, and others reply if and when they wish to do so (Li, Dong, & Huang, 2009; Sela, 2010b; Shana, 2009). There is evidence from former research that forums provide a way to extend F2F discussions, encourage exploratory learning, increase cooperation among classmates, and motivate students to use higher-order thinking skills (Sela, 2010b; Shana, 2009). In the present study, a discussion forum was used to supplement 50% of the time of a particular class. That is, the class met once a fortnight instead of every week, and made up the rest of the work through the discussion forum. As this was a workshop situation – primarily composed of class discussions in the F2F lessons – the discussion forum seemed an appropriate replacement. The class comprised novice teachers in their first year of teaching, and the discussions centered on their work at school, the problems they were facing, and other matters of concern to novice teachers. During the two-year duration of this action research cycle, data were collected from the two classes that had used the discussion forum in the manner described, and the material was analyzed in two ways. Firstly, content analysis and categorization were performed on forum postings. Secondly, the students were asked to provide written feedback regarding the forum in an open essay; content analysis of these texts was also carried out. Pedagogical issues (80 strings, 37.9%). This category includes all strings dealing with pedagogical issues, such as teaching materials, beneficial and problematic activities and assessment issues. Success stories (30 strings, 14.2%). Many categories began with a success story, with or without a suggestion of others following this example. The string would then continue with expressions of support, friendship or praise. Classroom management issues (27 strings, 12.8%). This category was expected, as novice teachers often experience classroom management problems. Personal issues (26 strings, 12.3%). This category includes general personal issues, as well as work-related personal issues. Problems with individual pupils (20 strings, 9.5%). Many of the novice teachers experienced problems in dealing with specific pupils as individuals rather than with entire classes. Moral issues (15 strings, 7.1%). A few student teachers shared with their peers the moral dilemmas they found themselves facing. Issues of teamwork and staff relationships (13 strings, 6.2%). This category includes all strings dealing with the teachers' relationships with the other teachers in school. "I found the forum useful because it answered a lot of my questions as a new teacher. I got a lot of advice from a lot of different people that come from different backgrounds and therefore have different opinions and worldviews. I also learnt a lot from my colleagues' problems just by reading about them and if I happened to come across the same problem I now know how to tackle it." "I think that the objective of the forum was to create some sort of peer communication which will help us as new teachers develop and grow. I also think that the objective was to create a sort of support group." "I also felt your [the lecturer's] comments were missing; with all due respect to my classmates and their opinions, I think I needed a professional voice to be heard (not on all issues, of course, only the most critical)." "This year I started my personal site through which students could contact me, but the forum helped me made a decision. Next year I am going to open a forum like this for my classes and consider participating and writing to one another (serious notes only) as a part of the students' grade." Figure 2 illustrates the second research cycle. After two years of using wiki and a discussion forum in two classes (as additional components) in a F2F class, and following data collection regarding their effectiveness, the author was largely satisfied with the improvement seen in students' social learning through the use of the online tools. However, it was felt that the potential of CSCL had not been fulfilled, and that CSCL could possibly be taken a step further, making it the focus of an entire course rather than just one additional element. This led to the third action research cycle, described next. In this cycle an attempt was made to construct an entire course given online, most of which used online social media tools. After much searching and researching for available tools and programs, a decision made to use an asynchronous social media tool called CeLS (Collaborative e-Learning Structures) (Ronen, Kohen-Vacs, & Raz-Fogel, 2006) for the bulk – approximately 80% – of the course, and a synchronous web-conferencing tool (Interwise, and later, Elluminate Live!) for the remaining 20% of the course. CeLS is a web-based system in which the instructor can construct activities made up of any number of stages. Each stage comprises a combination of distinct objects of four different types: presentation, input, interaction, and communication. The objects are completely technological, and the activity is imbued with pedagogical meaning by the instructor (Ronen et al., 2006). The most important feature of the CeLS tool is its socially based conceptualization. Although each student works individually at home, the activities are all collaborative, and students are expected to relate to their peers' work in various ways. The course was divided into topic-based modules, each one consisting of one synchronous session and two to four asynchronous CeLS activities. The class met face-to-face once at the beginning of the year for an orientation session that centered on the different technological and pedagogical aspects of the course, and again at the end of the year, for a feedback session. All course work and evaluation was conducted online. "I like the format of the course very much. It reflects a well organized learning process." "I think this makes the course more interesting and dynamic, more up to date." "I'm definitely in favor of this format, as it appeals to different learners and different learning styles." "I don't like to take an entirely online course. I would prefer a mixture of online and face-to-face." "As a social person I prefer face-to-face learning. Online learning seems strange to me." The second comment above demonstrates that at least one student did not appreciate the social value of the work they carried out on the CeLS tool; this was unexpected and certainly caused the author to reflect on the way the course and the CeLS tool specifically, had been presented to the class. As the idea of CSCL was central here, it is unclear why this student felt it did not suit her character as a social person. The third action research cycle is graphically summarized in Figure 3. 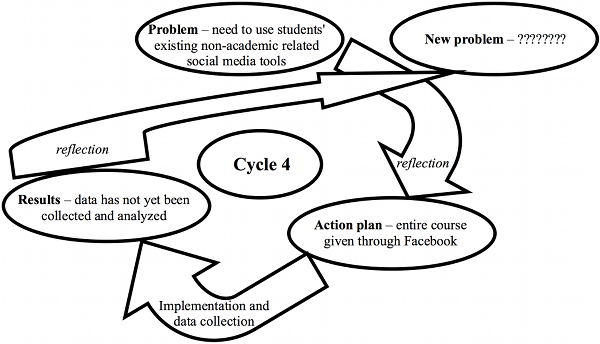 The fourth action research cycle is now at the planning stage only. At the present time, the author is reflecting on her experiences in the third cycle, and considering ways to improve the students' CSCL. The current literature seems to indicate that the direction for the future (or for the present in many cases) is educational use of very popular online social tools, such as Facebook and Twitter (Arnold & Paulus, 2010; Minocha, 2009; Park & Son, 2011; Rutherford, 2010). This is intended to be the focus of the fourth cycle of the ongoing action research project described in this paper, in an attempt to integrate CSCL as much as possible into the author's work in pre-service teacher education (see Figure 4). The action research described above comprises three cycles, and brief reference to a planned fourth cycle. The basis for the entire study was the author's aspiration as a teacher educator to incorporate cooperative learning in her courses, based on its inherent value as a learning paradigm and its many advantages, as discussed earlier in the Literature Review. During the incorporation of cooperative learning in each cycle, evidence of the benefits was collected; this consisted mostly of learning products in the form of student-generated texts of various types, and student feedback, collected at the end of each course. Analysis of the data, together with deep ongoing reflection, led to the next stage. The first stage took place in a completely F2F environment, incorporating various types of pair and group work activities. This was well received by the students, but when online learning was introduced, F2F activities were no longer perceived as sufficient. The next stage of the action research took the author in the direction of blended learning, integrating F2F with online activities in each course, with specific emphasis on wiki and discussion forums and online social tools. As detailed above, most of the students were satisfied with both the technological and social aspects of the CSCL tools, but there was a minority who had negative responses. These students complained about technical difficulties and, more importantly, about social difficulties created by the tools. Apparently, as other studies endorse, this type of activity does not suit all learners (Li et al., 2009; Minocha, 2009; Park & Son, 2011). From using CSCL in blended learning the author moved to the next stage, using it in a fully online course. Here a combination of a synchronous and an asynchronous tool was used, and the results were mostly, but not entirely, positive (as detailed above). Perhaps the most unexpected finding in this stage of the study was that some students found the course to be not social enough, although it had been structured to be a fully social endeavor. Apparently some students still see social relationships as based on F2F activities only, in spite of forecasts in the professional literature for the future (and to a great extent the present), for an upsurge of online socializing (Raidal & Volet, 2009). These outcomes call for a further stage in the action research. The author chose, however, to publish the results at this point rather than waiting until the completion of the fourth cycle, as, by definition, action research is never finished (Foreman-Peck & Murray, 2008). One solution always leads to another question, and the "reflective practitioner" (Schön, 1983) continues to search for ways to improve her practice. As stated above, the nature of action research does not invite, and indeed does not allow for, generalization of results and conclusions (Cohen et al., 2000). Thus, the present study cannot be regarded as a basis for recommending the use of CSCL. However, it offers several suggestions that lecturers at pre-service teacher education colleges may wish to consider. First, teacher educators must always remember that they serve as role models for their students, with intention or without. In this context, keeping up-to-date with technology and at the same time maintaining beliefs (such as the value of cooperative learning) set a good example to students for coping with the complexities of teaching. Second, the examination of both beliefs and practices is of utmost importance, and should continue throughout one's entire teaching career. Teachers (as well as teacher educators) need to engage in lifelong learning, which can take many forms (such as action research); the choice is immaterial as long as it improves teaching practice. Finally, the data collected in the present study show that, whichever choices are made, there is no single perfect tool or activity. There will always be students whose learning style, personal beliefs, or preferences will not be satisfied, and such students must also be taken into account at the course planning stage. It is the author's hope that other lecturers will find this account useful and informative for using CSCL, and, more generally, will see it as a recommendation for adopting action research to examine their own work, in an attempt to constantly improve it, whichever direction they may follow. It must be noted that the present study has a number of limitations. First and perhaps most importantly, this is a case study, and thus, does not represent anything but itself. Therefore the reader should make well-considered reference to the study, in order to inform her practice. It is recommended that a follow up study examine the issue of CSCL in pre-service teacher education from a wider perspective, using either a qualitative or a quantitative research paradigm, or a combination of the two, in an attempt to achieve broader, more generalizable results. In addition, due to the different nature of the three action cycles described above, the data collection was inconsistent, thus limiting the author's ability to draw clear conclusions. And lastly, as the author was the teacher in question, and the study describes her own work, there is always the danger of possible bias, which must be taken into consideration. An effort was made throughout the research process to control any bias, but it is by no means certain that it was not present in a subconscious manner, thus affecting both the author's teaching and the study. Aronson, E., Blaney, N., Sikes, J., & Snapp, M. (1978). The jigsaw classroom. Beverly Hills, CA: Sage. Coghlan, D. (2004). Action research in the academy: Why and whither? Reflections on the changing nature of research. Irish Journal of Management, 25(2), 1-10. Johnson, D. W., & Johnson, R. T. (1992). Positive interdependence: Key to effective cooperation. In R. Hertz-Lazarovitz, & N. Miller (Eds. ), Interaction in cooperative groups: The theoretical anatomy of group learning (pp. 174-199). Cambridge, UK: Cambridge University Press. Ronen, M., Kohen-Vacs, D., & Raz-Fogel, N. (2006). Adopt & adapt: Structuring, sharing and reusing asynchronous collaborative pedagogy. In S. A. Barab, K. E. Hay, & D. T. Hickey (Eds. ), Proceedings of the Seventh International Conference of the Learning Sciences (Vol. 2, pp. 599-605). Bloomington, IN: International Society of the Learning Sciences. Sela, O. (1995). Interaction in two group work methods in the teaching of English in a mixed-ability class (Unpublished master's thesis). Tel Aviv University, Tel Aviv, Israel. Webb, N. M., & Palincsar, A. S. (1996). Group processes in the classroom. In D. C. Berliner & R. C. Calfee (Eds. ), Handbook of educational psychology (pp. 841-873). New York, NY: Macmillan.